PODCAST 196 HAS A LOT OF SUGARS! Welcome to the most important announcement you will here today! This is the podcast we have all been waiting for: It's just the three of us, we talk about videos and video games, but all that is nothing compared to the Candy Lasagna! 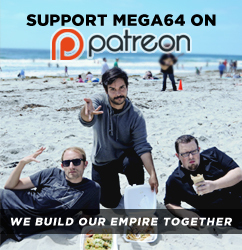 Listen to us chew here! That's all for now, in case you haven't already seen it, check out our new Mega64nimation video: Obama's Sumo!! !